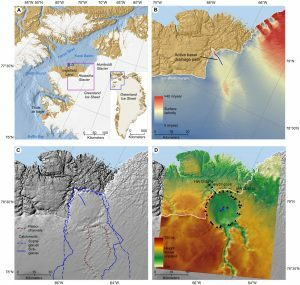 If you’re plugged into science news outlets, you’ve likely seen stories about a very large crater that has been detected underneath Hiawatha Glacier in northwest Greenland (e.g., at Science News). Here’s the link to the peer-reviewed article in Science Advances, by Kurt Kjær and colleagues. This paper is being touted by some outlets as likely vindication for the “Younger Dryas Impact Hypothesis”, made famous by Firestone et al. (2007). This may sound exciting to science consumers, but for many climate scientists, this is cause for groans, not exhilaration. After seeing the headlines, a few questions that might arise are: 1) How much does Kjær et al. (2018) support Firestone et al. (2007)? 2) Wait, what was Firestone et al. (2007) all about? Actually, the first question might be: 3) What the heck is the Younger Dryas, anyway? Figure 1 from Kjær et al. (2018), showing the location of the impact crater in northwest Greenland. Question 2: In 2007, Firestone et al. proposed that a comet exploded over North America, leading to myriad devastations: Widespread wildfires across North America, collapse of the Clovis culture, the extinction of North American megafauna (e.g., woolly mammoths), and the abrupt onset of the Younger Dryas. Firestone et al. proposed a comet in part because there was no impact crater in North America and in part because the geochemical evidence they presented was “more consistent with an impactor that was carbon-rich, nickel–iron-poor”. What followed was a contentious tear-down of the Firestone hypothesis. I have 40 papers saved on my computer about this stuff, and it got nasty. Not only were the conclusions disputed, but also the results. Some scientists presented contrary evidence using similar methods (Paquay et al. 2009; Daulton et al. 2010). Others questioned the validity of evidence presented by Firestone et al. (Buchanan et al. 2008; Tian et al. 2011). Some scientists even tried to replicate the results at the same study sites but couldn’t ( Surovell et al. 2009; Haynes et al. 2010). By 2011, Pinter et al. published a paper called “The Younger Dryas impact hypothesis: A requiem”, declaring it dead. 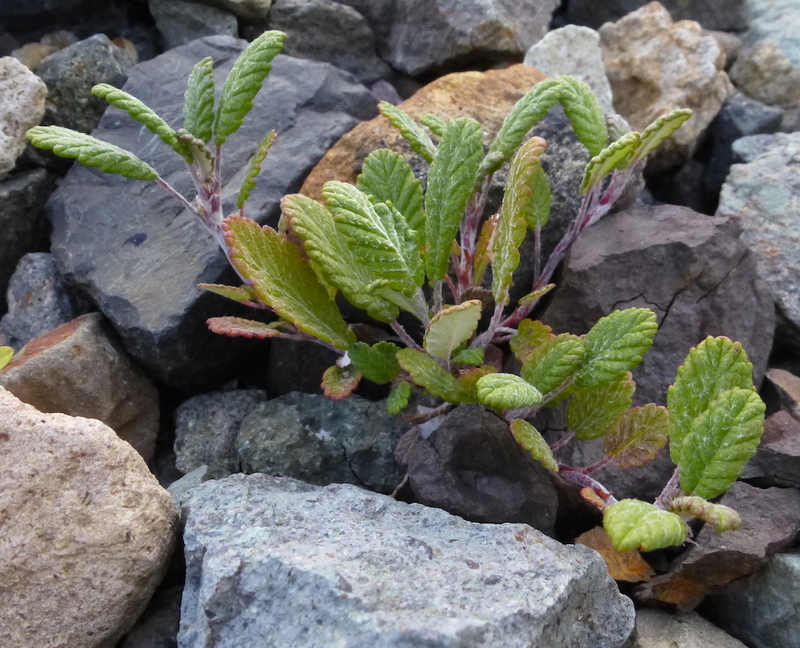 Of the original 12 lines of evidence provided by Firestone et al., 7 proved unreproducible, and the others were given alternate explanations, such as non-catastrophic mechanisms (e.g., an uptick in wildfires can be explained by drought) and/or terrestrial origins (e.g., magnetic grains occur many river sediments). The timing. The authors of the new paper state that the impact probably occurred during the Pleistocene. That’s about 2,576,000 years of Earth history, and the Younger Dryas is dated down to decades. Looking deeper at the paper, it seems most likely that the impact was in the later part of the Pleistocene, so it is absolutely possible that it hit at 12,900 years ago. However, even if we give error bars of ± 100 years on the Younger Dryas onset and say the impact had to be during the last 100,000 years of the Pleistocene (the last 3.8%), there’s still a 99.8% chance that the impact did not overlap with the Younger Dryas onset. So it’s too soon; we need to date this crater. Even if an impact occurred at 12,900 years ago, it doesn’t change the state of the evidence regarding mammoths or humans. As summarized in several of the above papers, there’s no consensus of evidence for a catastrophe at the Younger Dryas for either. 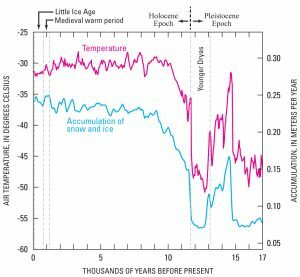 We still need an explanation for getting out of the Younger Dryas at 11,700 years ago. And we still need an explanation for the various other abrupt climate shifts apparent in the Greenland ice cores. So the terrestrial mechanisms that caused other events (ice sheet and ocean dynamics) could still cause the Younger Dryas even if an asteroid could, too. The authors of this new paper are very clear that their geochemistry matches an iron meteorite. Firestone et al. were very clear that their geochemistry matched an iron-poor impactor like a comet. To their credit, Kjær et al. are appropriately cautious in voicing implications. They never mention the Firestone hypothesis; they are conservative in their dating; and they do not speculate about broader implications beyond “this impact very likely had significant environmental consequences in the Northern Hemisphere and possibly globally”. (It does seem to be one of the top 25 largest in the world.) Now, if it turns out we later find this impact was at 12,900 years ago, that will get me excited. p.s. If you’re wondering, yes, there’s also an Older Dryas period. 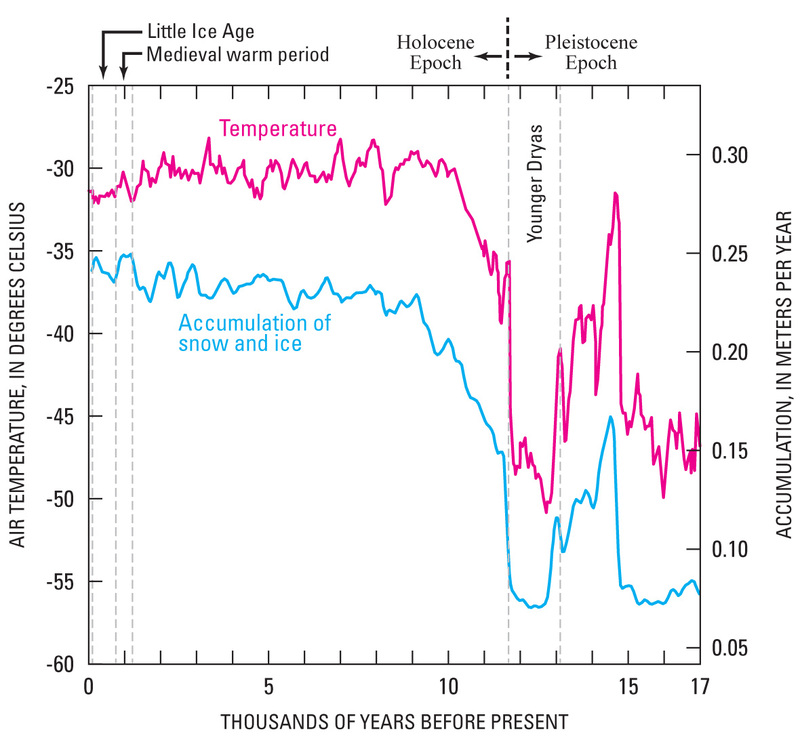 It’s similarly cold but much shorter and happened around 14,000 years ago. Both periods are named after the Dryas genus, which is abundant in Scandinavian lake samples dating to these periods. Excellent post Dr. Crawford – this is our required reading in Geomorphology this week. Thanks. Well done, Alexander. The best summary and assessment out there. I’ve given your post to my classes as well. But what about Atlantis, eh? What about the Great Flood scientists have been trying to hide for generations? You geologists are part of the great reptilian Illuminati conspiracy. Since geologists are the best story-tellers in the sciences, what with data sets fraught with gaping holes, none of this should surprise us. We weave intricate legends from bits of rock, thinking nothing of million-year gaps, or error bars far larger than our trend-lines. None of us should be so beholden to our pet hypotheses that we fight with each other over our mythology. Yet, ego wins out, and fight we do, when we should be telling our stories on dark, cold nights, in front of roaring fires on lonely mountaintop retreats. On a vaguely more serious note, one of the best bets for odd periodicity we see in some of these data sets is the mystical Planet X (or Planet 9, now that Pluto is recognized as being nothing more than one of many similar Kuiper Belt objects). The search for a more massive Kuiper Belt object, one which has gravitationally sculpted others along its proposed 10-20,000+ year orbit, may very well show yet another cycle to add to our beloved Milankovitch. A Neptune-sized disruptor could very well cyclically launch large numbers of comets our way, which could then lead to climate disruption (https://solarsystem.nasa.gov/planets/hypothetical-planet-x/in-depth/). There is much we don’t know about the outer Solar System, and it would not surprise me that these astronomers are correct, and we will find another climate Nemesis lurking in the dark outer regions of our local Universe, waiting its turn to launch icy pebbles into our cozy patch near the Sun. And the beauty of comets, for geologists, is that they often leave little trace of their arrival on Earth. What better for a good climate whodunnit? I’m glad that was useful for class, Greg! Bill, that’s an interesting angle about the hypothetical Planet X and it’s potential role in comet orbits. The Younger Dryas and other similar events like the Heinrich Events and Dansgarrd-Oeschger Events https://www.ncdc.noaa.gov/abrupt-climate-change/Heinrich%20and%20Dansgaard–Oeschger%20Events have a nasty problem of being loosely periodic but irregularly so. They are undoubtedly responses to changes in the Laurentide Ice Sheet, which means they’re climate-related, and they do seem to have global implications.The longest interval is with the Heinrich Events (which are cold events and act similar to the Younger Dryas), which go to up to 10,000 years apart. The problem with that is it’s often too short for a Planet X cycle. Now, one could propose that multiple triggers can lead to the same result, in which case a complex including comets, iron meteorites, internal dynamics of ice and ocean, volcanoes, and the wrath of God can all be on the table. Mark, in the Gaia article, I notice that the dust from the impact lingers in the air for hundreds of years the first time it’s mentioned, and then 1,600 years later. Either way, if that much dust stayed up in the atmosphere for that long starting 13,000 years ago, it ought to be detectable in the ice cores in the south and middle of Greenland (where the ice core records extend far back into the Pleistocene). They can pick up volcanic eruptions in Indonesia like Toba, after all. So I think these ideas are testable with datasets we already have. In other words, it sounds like the ice core experts will get some more papers published. Alex, the beauty of the Great Disruptor, specifically for comets, is that it need only be semi-regular, time-wise. One could invent infinite scenarios where our puny target planet would get pummeled only every-so-often, based on the innumerable combinations of our orbital position, whether the Great Disruptor is incoming or outgoing, what part of the Kuiper Belt it traverses, and where the gas giants are lurking in their orbits, with respect to the GD and Earth…. I am very fond of comets because they can litter the upper atmosphere with lots of water vapor, conveniently placing it where it can make best use of its impressive near-IR absorption peaks, nicely in tune with the massively strong incoming solar radiation. The real question is: if you could contaminate the upper atmosphere with enough primordial water vapor to initiate a climate event, would it leave a traceable oxygen and/or hydrogen isotopic signature…? Perhaps too many Rumsfeldian unknown knowns (or would that be known unknowns?) for my taste. Heck, we could even invoke a remote, and conveniently invisible, brown dwarf (that would be the failed star variety), lurking in the near far-off, since we are blissfully ignorant about what we can’t see out there. I, personally, will try to avoid the WOG scenario in my stories. You’re a good sport to entertain all of our good-humored teasing! And so close to the end of the term, too! The energy of youth! Thank you for that encouragement! I hope we continue to find topics of interest to highlight!